Sure, you already know that breakfast is important -- but that doesn't mean it's always easy to make time for it during busy mornings. And if you're going low-carb, many breakfast staples -- like traditional cereal, muffins and English muffins -- are off-limits, so it's harder to grab breakfast on the go. Even so, you don't have to spend hours in the kitchen to get a healthy low-carb breakfast. It's actually easy to whip up a simple-but-scrumptious morning meal. 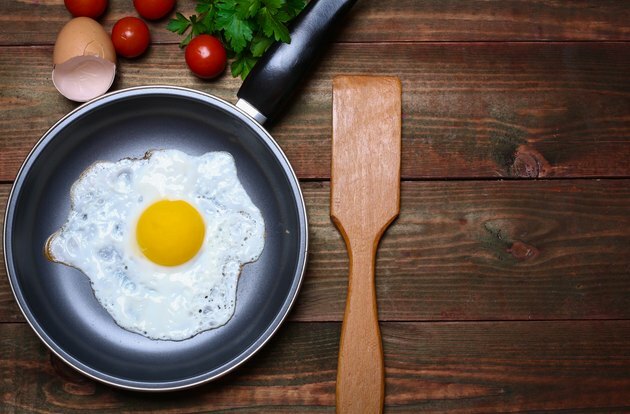 When it comes to low-carb breakfasts, eggs are your new best friend. Not only do they pack in 6 grams of virtually carb-free protein, but they're also quick and easy to cook. Make a healthy fiber-packed egg dish by scrambling two eggs with spinach, red peppers, mushrooms and a sprinkle of Parmesan or cheddar cheese. Or chop hard-boiled eggs -- which you can cook ahead of time -- and mix them with black olives, chopped cucumber and feta cheese for Mediterranean-inspired egg bowl. If you have extra time on the weekend, prepare low-carb breakfast burrito filling from scrambled eggs, chopped veggies, low-fat cheddar and a couple tablespoons of ham or black beans. Store it in the fridge, and spoon the filling into romaine leaves for low-carb breakfast "boats" that come together in a snap. If you prefer to avoid eggs, try these tips using crumbled tofu, instead. One-half cup has 10 grams of protein but only 1 gram of digestible "net" carbs. You might not be able to eat fluffy, carb-rich pancakes on your low-carb diet, but you can make an easy high-protein alternative. Simply stir a scoop of your favorite protein powder with one egg and a teaspoon of vanilla extract, then mash with one-quarter of a medium banana, which has 6 grams of net carbs. Cook the resulting "batter" over low heat in a skillet until golden brown and voila -- flavorful pancakes, minus most of the carbs! Experiment with different flavors to prevent boredom -- try making "strawberry shortcake" pancakes by using two or three pureed strawberries in place of the banana, or add cinnamon or cardamom for spicy flavor. Protein pancakes store well in the fridge, so you can make them the night before, store them in a freezer bag overnight and eat them on-the-go the next morning. Try whipping up a large batch of pancakes on the weekend so you can eat them throughout the week. Parfaits prove that breakfast can be delicious, low-carb and Instagram-worthy. Make your parfait low-carb by placing layers of plain Greek yogurt -- which has just 6 grams of net carbs per container -- between layers of pumpkin seeds or chopped almonds, then sprinkling the whole parfait with cinnamon. Or make a lemony low-carb parfait by mixing lemon zest into your yogurt, then topping your parfait with strawberries, which have just 5 grams of net carbs per 1/2 cup of sliced berries. If you're feeling creative, try a savory Southwest breakfast parfait. Layer low-fat cottage cheese -- which has 4 grams of net carbs per 1/2 cup -- with shredded cheddar and salsa, then sprinkle the parfait with jalapenos for a little extra heat. Don't worry if you don't have any time for breakfast preparation because you can make drive-through fare work if you're in a pinch. Avoid the traditional breakfast sandwiches available at most fast-food places -- the English muffins and bagels used to make them come packed with carbs -- and instead simply ask for a fried egg or egg white topped with cheese and ham. Or ask for a breakfast wrap sans the wheat wrap -- you'll get an egg "bowl" similar to the one you'd have made at home. While fast-food breakfasts can work in a pinch, don't make them a daily part of your diet. Certain fast-food breakfasts might be low in carbs, but they're still high in sodium, so save them for an occasional treat.